If you’ve read my blog before, you know well that I’m a bit of what the Brits call a “Petrol Head” – I like cars. And I like driving fast cars on race tracks and watching fast cars race, both in person and on TV. Folks that are not racing fans don’t get why I like seeing cars going in circles and well, I don’t pretend to enjoy watching soap operas or golf on TV either (can’t stand either of them). 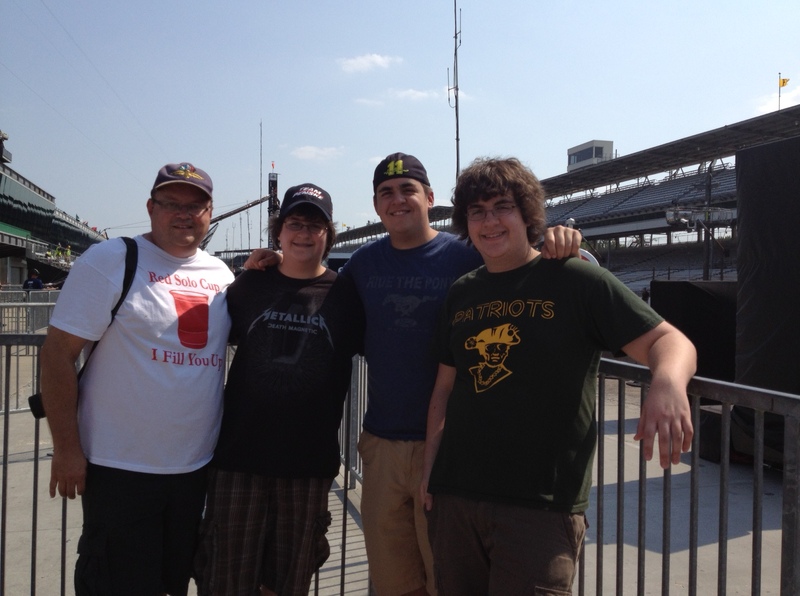 That said, I think everyone ought to go to the Indy 500 at least once in your life. It truly is an American spectacle where the enormity of the event outweighs what actually takes place at the event itself. 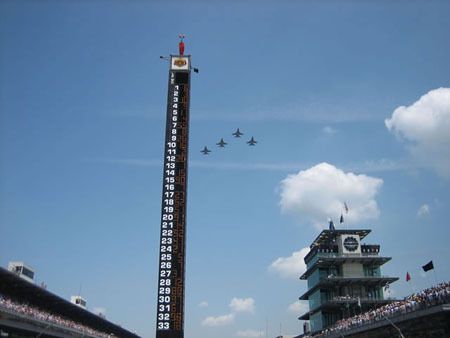 Going to the Indy 500 isn’t about cars making 800 left turns at better than 200 mph (although that’s way cool) – it is about witnessing something truly and uniquely American. 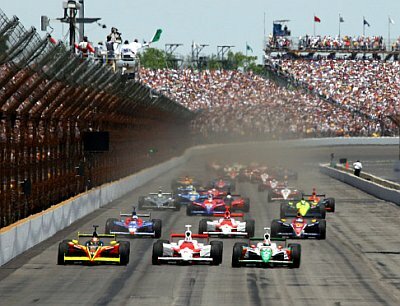 I have been going to the 500 for more than 25 years now – my first 500 was a spur of the moment thing that happened with my long-time hometown pal Tom called me the Thursday before Memorial Day in 1987 to ask me to go as his father-in-law couldn’t make it with him. Of course I said “Hell yes!” and a life-long tradition was born. I’ve only missed three races since then – one when a friend of mine was getting married (and didn’t wind up getting married that day … whoo that’s a long story, one when my twins’ birth was potentially imminent (it happened just three weeks later), and once when my sister-in-law was getting married. Two out of three of those were worth missing the race. The race was Sunday of Memorial Day weekend. I’ve already ordered my tickets for next year. Two days after the race. This year was the 96th running of the race, and the 101st anniversary of the race. There is not a single sporting event that has gone on this long. It has been for years, and continues to be the single largest-attended event in all of sports. 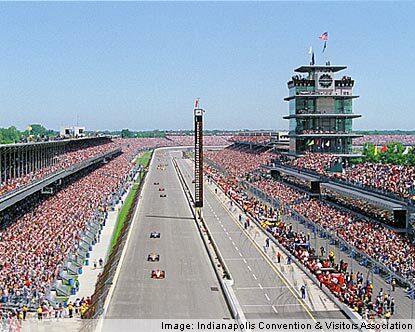 Even though attendance is down from the heyday of Indy racing in the late 1980s, when attendance was nearly 500,000 people, 300,000+ people still go to the race, with more than 250,000 seated in the stands. Pretty amazing. The track itself is stunningly huge – the track is 2 ½ miles as a square-cornered oval. The straightaways are 5/8s of a mile long, the “chutes” between the corners 1/8 of a mile long each and the corners are about ¼ mile each. The actual facility is huge – more than a mile from north to south, and ¾’s of a mile from east to west. There is an 18-hole golf course on the grounds – 9 holes of which are in the infield of the track! The track also features a nearly-3-mile per lap road course that uses about 1/3 of the oval and then snakes through the infield. 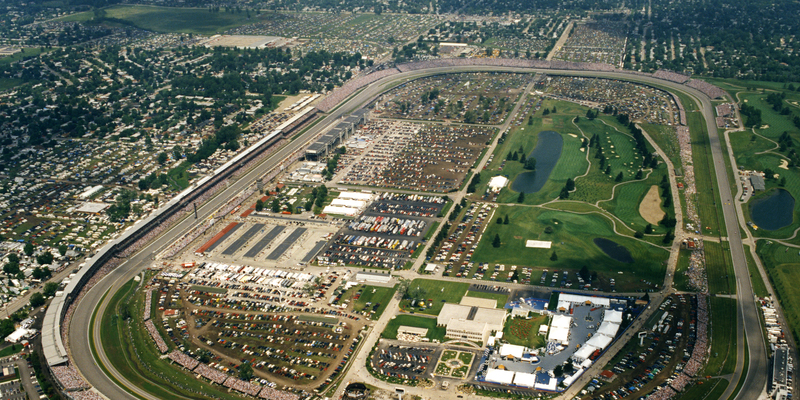 The roadcourse is used for the US Moto Grand Prix. I’ve heard a stat that 15 NFL-sized stadiums would fit inside the track. I believe it – it’s huge. 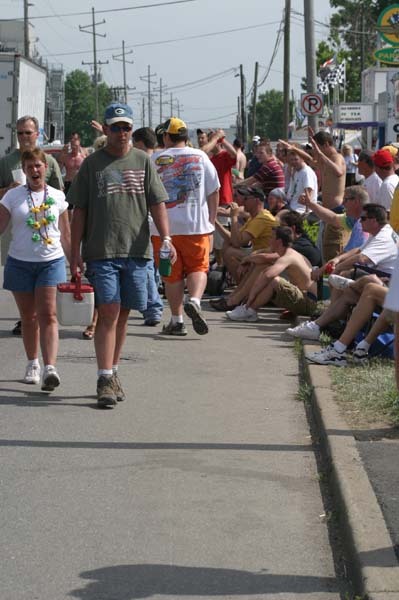 The track was originally paved with bricks – and hence earned itself the name “Brickyard” – the namesake of the Brickyard 400 NASCAR race held there in August. There is one yard of the bricks left exposed – at the start/finish line. The speed at which the cars go around this track is simply stunning. There’s nothing in your life that can calibrate your senses for it. They go by so fast that your eyes cannot track them unless you pan your head like a camera. Seriously. To give you a sense – this year’s qualifying speed around the track was a four-lap average of around 227 mph. That’s straightaways and corners combined – which means that the cars are going nearly 250 mph at their peak in the straightaways and more than 210 mph in the corners. To give you another idea – jet airliners typically leave the ground at approximately 165 mph. … and more and more. So, you’re asking, “OK, it’s huge. The cars go really fast. It’s got a great history, and lots of people go. Meh. Why should I go? A parade of military personnel walking up the main straightaway as part of the opening ceremonies – always gets a huge standing ovation. 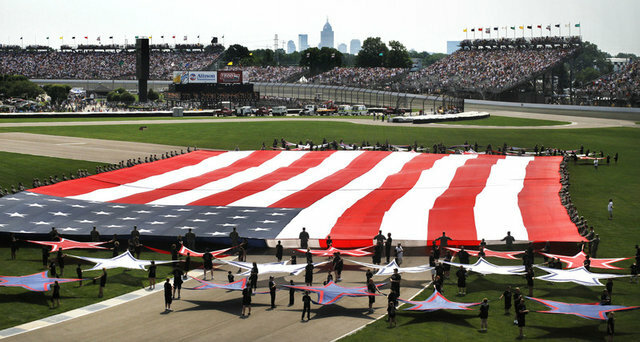 A parade of the same military personnel riding around the track in the back of convertibles or trucks waving to the crowd – again, a standing ovation. A haunting moment of silence to remember those that died for our country, where all 300,000 or so people all stand silently – followed by the most haunting rendition of “Taps” you’ll ever hear – a lone bugle, ringing over the sound system across this gigantic facility. With all 300,000+ people standing silently, remembering. Goose bumps! Performed renditions of America The Beautiful, God Bless America (sung by Florence Henderson), and “Back Home Again in Indiana” (sung by Jim Nabors). An invocation prayer – this year’s was especially great. A military jet flyby (this year was “multi-generation warbirds” that included P-51s from WWII all the way to an F-16. In years past, there have been stealth bombers, Harriers, F-16s, F-14s, B-52s, etc. etc.) at the end of the National Anthem. And more … all kinds of America there. 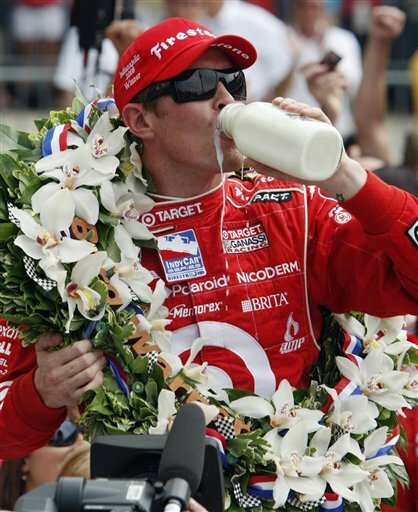 Plus, there’s all the traditions – the bottle of ice-cold milk served to the winner along with the rose wreath (that always makes the winner look like some sort of racehorse), Gasoline Alley – the garage area, where fans can walk and mingle among the drivers and crews, the three-abreast start, which is the only place in motorsports that this occurs (interestingly, at the narrowest oval track in all of motorsports), and much more. 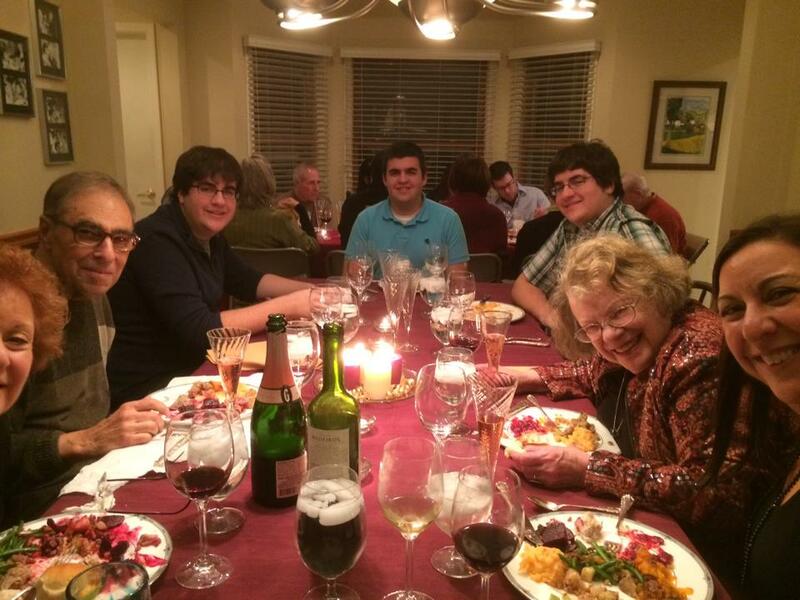 And it’s family traditions – we know so many people where going to the 500 is something the family does together. You see it all over the stands – people renew their seats over and over and get to know the people next to them – it’s like a strange, annual family reunion. My own traditions on this are even more fun. 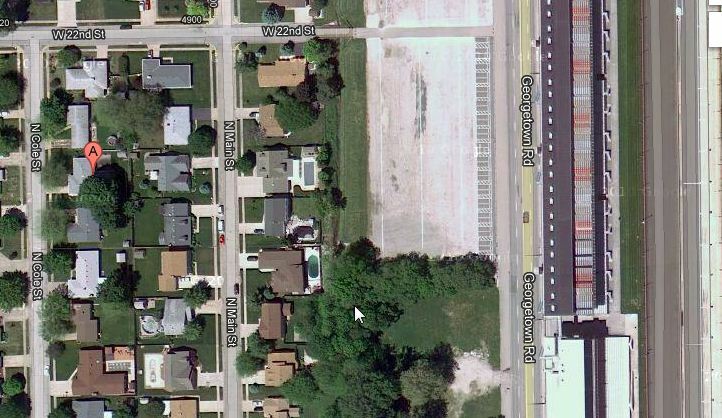 For starters, where we park – we park in the yard of this small house in Speedway, IN – here’s a Google Maps view of it. A kindly old woman by the name of Mary Ann owns it – her husband, Art, passed away a few years ago. I’ve been parking at Mary Ann’s house for more than 20 years now. There’s a whole group of folks there where, for one day a year, we catch up with each other’s lives. We’ve all seen our kids grow up from babies to toddlers, to grown men (as my sons are now) – we’ve seen new friends introduced. There’s also been a few of those touchy moments where someone who has been there for years, just isn’t anymore … as the person has died. Divorces, new husbands, kids coming “out”, etc. A little microcosm of life on Cole Street in Speedway, IN. 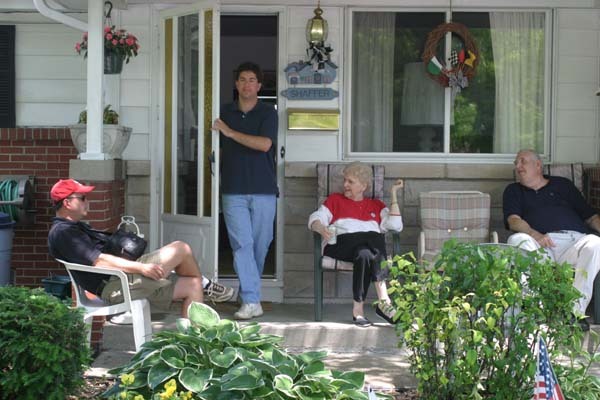 Staying at Mary Ann’s is like staying at your grandma’s house – and comes with all the comforts of home – she just opens her house to those that park there. Most are not strangers and are repeaters, but … once a year friends. We’ve slept in the house when the weather has been bad (this year, Joel and Brian slept inside in the A/C while Alex and I “marinated” in the tent outside in the heat), we can take showers in the morning. She feeds us a wonderful breakfast of egg strata (I like to call it “cholesterol express”) and Monkey Bread – other folks bring donuts, and there’s always a steady flow of coffee. Our usual race weekend has us driving to Indianapolis on Saturday morning, arriving at Mary Ann’s place in early afternoon. Job 1: Open the coolers and grab a beer. 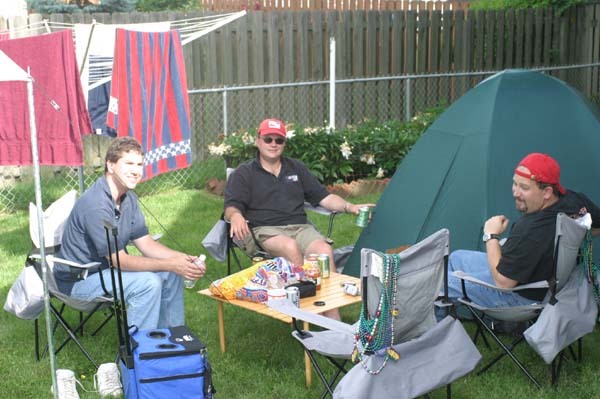 Job 2, unload, and set up camp – a tent in the back yard, portable grill, table and chairs, etc. From there, we usually head over by the track to walk around – outside the track’s main straightaway stands is Georgetown Road. It becomes a pedestrian mall of sorts – there are food vendors, RVs parked and playing music, wacky people hanging out, etc. Indy has a reputation of being Mardi Gras like, and the tradition is the guys encouraging the girls to, umm, “share” … so that’s going on all day as well. There’s a fan fest at the track itself, with big companies having exhibit tents, games, etc. And the Speedway Hall of Fame museum, which we toured this year for the first time. From there, we get back to Mary Ann’s later in the afternoon, sit in the shade of the big tree in the back yard and have a beer or two – this year, we got into a spirited Eucher game (it’s a card game). We snack, and then fire up the grill and grill some nice-sized steaks, with baked potatoes, a salad, etc. Later in the evening, we usually wander back over to Georgetown Road to people watch – that’s when the weirdness cranks up to 11. Besides the aforementioned Mardi Gras action, there are wandering bands of evangelicals trying to convert the sinners, many, MANY more sinners pointing out to them that it’s not happening. Families, guys and girls walking together, groups of goofy drunk guys, etc. It is quite a scene to see. We usually split from there by 11:00 or so – as about then, it starts getting pretty crazy, and I don’t need to be around when a fight starts. We dive into the tent and go to sleep – only to be awakened at 5:30 AM by a ground-shaking BOOM! – the military bomb that they set off in the infield of the track to announce that the track gates are now open. We usually manage to drop back off to sleep for another hour or so, then emerge from the tents and head inside to line up to take a shower, get coffee and be around as the rest of Mary Ann’s crew arrives – there are only a few of us that camp. After enjoying Mary Ann’s homecooked breakfast, it’s time to strike the campsite, reload the van, and head across to the race – about 2 hours before the start, where we enjoy all the pre-race festivities, and then, of course, the excitement of the race itself. When I decided to start ordering tickets, I was looking forward to someday attending with my wife and kids – our plan was always to have two children, and even if it were two girls, this was something our family was going to do. We didn’t plan on having three boys though, and this has turned out far better than I ever imagined. Over the years, I’ve of course done a bunch of “guys weekend” trips – myself and three buddies – a 24 hour exercise in competitive drinking, eating and general silliness. We’ve done couples trips where Robin goes and we bring another couple – and those are always a blast. And, for the last several years, it’s just been me with my three sons. 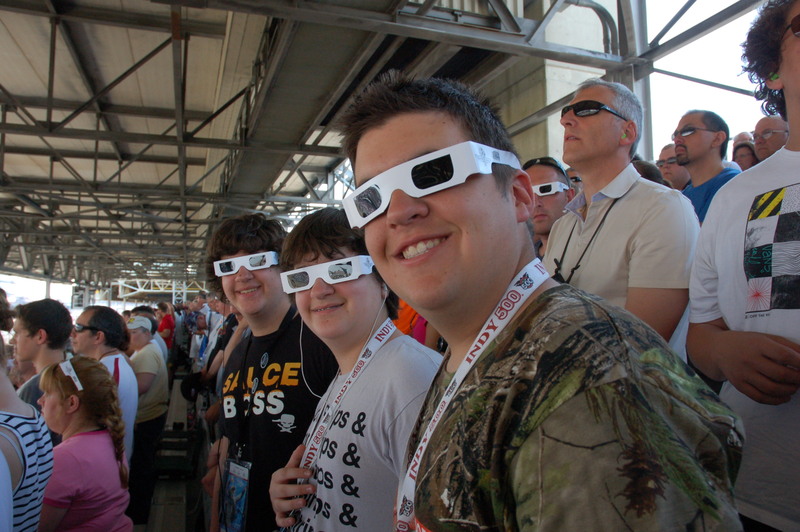 As I said, I never imagined ever when I started this, that I would be bringing my three boys with me. And to boot, I’ve got one studying to be an engineer, and he hopes to be working for a racing team for his career. I can’t imagine coming to the 500 as his guest. But I hope it happens! When you spend a major portion of your life working in digital marketing and information technology, you tend to wind up being the local expert on all things computer related. The irony of which is that you wind up generally hating goddamned computers. I enjoy using computers and technology – comes with being a serial early-adopter, but I do have to say at some points, I think I want to just skip them all across a pond and move to an island and never seen another one as long as I live. As usual, because of my helpful nature, I have managed to cast myself as being tech support for my family and for a lot of friends. I’m generally able to diagnose networking issues, sort out misbehaving iPhones/iPads, etc.,help out buggy email, eradicate viruses, rebuild computers and I’ve even built a number of “frankenDell” computers for the family out of obsoleted Dells that were castoffs from Robin’s family. So, I’m pretty good at this. But it doesn’t mean I enjoy it. Additionally, because I am, A) a social media addict; and B) work in the digital marketing realm where online search, social media and other online experiences are the stock in trade of what we do, I’ve become an expert in those arenas as well, both from a user perspective and from a business perspective, so plenty of people seek my advice there as well. As you can imagine, I don’t mind talking about this area – although while many of the principles that big brands use to achieve dominance in online marketing DO translate to local business, the scale at which big brands do this also enables their tremendous results – therefore, it frequently boggles the mind of a small businessman who is for example, struggling to get search ranking on his site, to find out that a company like a major brand spends multiple millions of dollars per year on just search engine optimization. On the tech support side, by and large the questions relate to internet connectivity – why can’t I get online, why does my internet connection seem so slow, how come my emails aren’t coming through, etc. etc. From an internet perspective, the questions generally run to how things work – how does Google decide which item to rank up first, how come Facebook changed to timeline, why, when I talk about something on Facebook, an ad pops up that seems to mirror that topic, etc. Don’t get me wrong, I don’t mind helping out – in fact, for the most part, I enjoy it, unless I’m trying to undo a problem that was self-inflicted, like some horrifying piece of spyware that a family member got by clicking on something that they shouldn’t have clicked on. One interesting thing about working in the tech business for all these past years is the number of silly acronyms that we seem to have regarding users of computers or products. “RTFM” is an admonition to someone that should consider perusing the product documentation. “PEBCAK” is an acronym that is used to classify a problem that seems to be rooted in user error. It stands for Problem Exists Between Chair And Keyboard. And of course the old fave: IIOHOINHAA. Actually, I’m pulling your leg – that’s not really an acronym. But it certainly represents a bit of advice I’ve given numerous times over the years when asked a question about “why did it do that? ?” In fact, it’s my first answer below. If it only happened once, it never happened at all. Just type that into Google. It will give you your answer. You can buy that on Amazon. You have to understand that the monetized product on Facebook isn’t the thing you interact with but instead is you – you’re Facebook’s product that they make money on. Just because you read about it on the internet doesn’t mean it’s true. Sounds like your web connection is down. Because Google has all the answers to everything, that’s why. That’s not good. I can fix it, but we’re talking serious bottles of scotch to get it done. It’s FM Technology. And Science!